Copy of photo from Home Directory of the Colored People of Chester, 1906 compiled by Lawrence L. Barrett & C. I. Wilson, available at DCHS. Church History: The following "Brief History of Murphy's A. M. E. Church" is taken from the Home Directory of the Colored People of Chester, 1906 compiled by Lawrence L. Barrett & C. I. Wilson. This reference is available at the DCHS research library. Murphy's A. M. E. Church was built in 1871. 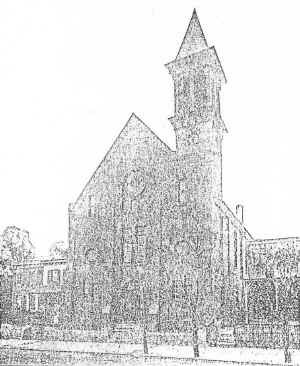 The ground was given by the then presiding judge of Delaware county, Judge John M. Broomall, on condition that the church be called after Father Murphy (as he was lovingly called). Rev. William Murphy was a local preacher in Asbury Church. He was very much interested in the mission which was under the care of Asbury A. M. E. Church. The mission met in the school house, which is known now as the Horace Mann School, at third and Jeffery streets. There were only seventeen members, but they were very enthusiastic and anxious to worship under their own vine and fig tree. Father Murphy volunteered to solicit means enough to purchase the ground. Being very well known, no trouble was anticipated. He applied to Judge Broomall first and after explaining his business, Judge Broomall agreed to give enough ground to build the church on. The little flock was jubilant over his success and arrangements made to build at once. Each member gave so many bricks, some of the members gave bricks for the children. Mr. George Weigand was the builder. In October 1871, the corner-stone was laid. The work was pushed rapidly, but there were several back sets and it was the spring of '72 ere the dedication. The pastor, Rev. Gilbert Waters, worked untiringly in the interest of the church. The following named persons were the charter members: James Green, Perry Wright, Elizabeth Green, Eliza Wright, John Peirrgan, John Turner, Rebecca Perringan, Annie Turner, William Cooper, Elizabeth Cooper, Isaac Woodfaulk, Lydia Woodfaulk, Lucretia Hall, Sallie Perrigan, S. S. Tiller, William Perrigan, Annie Tiller. Rev. Waters was a very successful pastor and paid several hundred dollars on the debt of the church. He was pastor for three years. The next pastor was Rev. Jacob Watson. Rev. Watson came just as the church came out from under Asbury Church. The membership had increased to such an extent that the members felt they could support a pastor. Murphy's was one of a circuit of three churches, Asbury and Mt. Hebron of Linwood being the other churches. Asbury was cut off and Mt. Hebron and Murphy remained. Rev. Watson was a Christian gentleman and paid several hundred dollars on the main debt, and added greatly to the membership. He remained two years. The next pastor was Rev. Wm. H. Davis. Rev. Davis was a wide awake, energetic pastor, he left the church in a prosperous condition after a three year's pastorate. Rev. Henderson Davis came next, he was greatly beloved by the people and was a straight forward, Christian gentleman, he remained two years. Rev. J. W. Davis came next, and remained one year. The church fell off in attendance during Rev. Davis' pastorate and the financial interests weren't so good. Rev. W. H. Davis was sent again to us, while the majority of the church wanted him, there were those who said he shouldn't enter the church. The door was locked and a disgraceful time ensued, several of the general officers interceded and the matter was settled. Rev. J. W. Norris came next. Never had the church a more successful period. Rev. Norris was an energetic Christian gentleman, he paid off the debt of the church and raised more money than had been raised in the church's history, he remained three years, and was removed amid the protest of the entire church, he was greatly beloved by the members and community. Rev. Thos. Moore was the next pastor, he remained two years. The next pastor was Rev. Thomas Cuff, the few months Rev. Cuff stayed here, marks a disgraceful period of the church's history. Rev. Cuff was a Christian gentleman. He was greatly maligned and several members of the church were in an uproar because it was said he didn't like dark skinned people. All the trouble hinged on the above report, and Rev. Cuff and family were made to suffer because of an utter falsehood. Rev. J. H. Buckner came next and he was among the most successful of the church's pastors, and left after three years pastorate. Rev. Amos Wilson was the next pastor. Rev. Wilson was a Christian gentleman, but the work seemed to run down, the congregation was small and the people seemed dissatisfied. Rev. Redmond Faucett was the next pastor. The work continued to go backward and the people were disheartened. He remained one year only. Rev. I. H. W. West came next. The work was in such a run down condition, the members felt disheartened, but Rev. West took hold cheerfully and heartily and in a few weeks the work commenced to revive, the membership and congregation increased and the members commenced to feel encouraged. Rev. West stayed four years and left the church in a prosperous condition. Rev. Santee Burch came next, that Rev. Burch was a successful minister, goes without saying, the present church stands as a monument to his memory. He remained four years and left greatly to the sorrow of the members and community. Rev. Elijah Boyd came next and remained two years. He and wife were greatly beloved, and were regretted by all who knew them. Rev. I. D. Jones came and remained two years, he was a Christian gentleman and faithful worker. Rev. J. G. Yeiser came next. His pastorate marks another disgraceful period in the church's history. The church came near being broken up. A prominent member and officer of the church was turned out because he paid a debt of long standing. The church was in an uproar, the church felt this stroke for some time. Rev. Yeiser remained two years and left unregretted. Rev. S. D. Smith was the next pastor, and was very successful, he remained two years. Rev. C. F. Warfield, the present pastor has been with the church two years. Never has the church been in such a flourishing condition, financially and spiritually, the church is moving, the pastor is beloved by both his members and other pastor's members, and the community at large, and already have the members commenced to regret the time when, owing to their discipline Rev. Warfield having stayed the full time, will have to be moved. � 2000, 2001, 2002, 2003, 2008 John A. Bullock III.